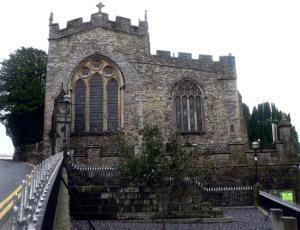 St Mary's Church, Haverfordwest ChurchIt is a fine example of the Decorated style of architecture but its foundations are much older and the remains of a Norman church are incorporated in the massively thick south wall. The north aisle was added during the C13th. The arches between the nave and the north aisle are fine examples of Early English stonework. Entry to the church is through the north porch which, with the tower and the south porch, was also added during the C13th. Most of the windows in the church are Perpendicular although the glass is modern. The oldest church brass in the county, an epitaph to John Davids, Mayor of Haverfordwest in 1642, and his wife Sage, can be seen on the south wall of the chancel. The inscriptions on the many marble tablets make interesting reading for visitors with time to inspect them. The fine oak panelled roof dates from the c16 and the Tudor rose is frequently seen in the carving. Its corbels are representations of men's heads on the south side and women's heads on the north side. The church has the oldest church registers in Pembrokeshire dating from 1590. These are deposited in the County Records Office in Haverfordwest. The organ is the largest in the county except for that in St David's Cathedral. We hope you will visit this special church and enjoy its peace and tranquillity for a while. We would be pleased if you would help us with a donation towards the continuing work of maintaining it. We hope you will visit this special church and enjoy its peace and tranquillity for a while. A487/A4067 & follow signs for town centre into Picton Place which leads to Victoria Place and the High Street.